But, you can make life easier and pass with less stress! We’ve compiled some tips on how to study and manage your time. Be realistic, give yourself some day’s off – learning to drive should be fun! Grab a sheet of paper and jott down time-slots in the week where you can study, and even your days off. Writing down your study schedule is important! It’ll help you keep to your plans. 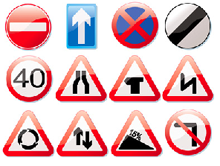 Theory Test Book – try going one section at a time. PC Software – useful for practising the Hazard Perception section. Interactive DVD’s – These can cater for all three tests in one package: Theory, Hazard and Practical Test Tuition. Apps for Phones and Tablets – nothing beats having all your study material with you and in your pockets at all times! There’s many apps out there to help. The hardest part about revising is STARTING! Fight that inertia, don’t think, just start! Every couple of years the Theory Test price rises and even changes. Now’s your chance to dive on in and tackle the challenge. Small Steps –break your study into easy 30-60 min slots throughout the week and tackle them one at a time.